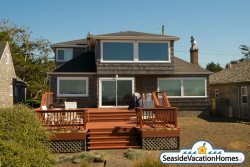 BEACHTOPIA at Seaside Beach: Just Listed For Summer: You are going to love the North townhouse at Beachtopia and its unbeatable views of the Pacific Ocean. The North unit offers an updated airy tranquil feel with almost completely new fresh surfaces throughout. From the imported Italian tile to the new quartz countertop and hardwood flooring Beachtopia offers an amazing retreat feel from the hustle and bussle of the real world! Best of all the distance from this property to the sand is so close you can watch the kids build castles while cooking a delicious meals in your fully equipped kitchen. Or grill and relax in the great patio area while the waves crash just over your shoulder. With downtown fun just a short stroll from the house you will easily be able to explore all that Seaside has to offer. This unit is available separate from the south side in July and outside of major Holidays and summer.